Row and/or ski at least 31,000 metres between October 25 and October 31 to get on the honor board and receive your certificate. 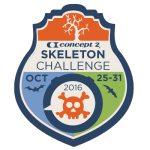 Adaptive athletes and juniors aged 16 and under can also participate at the new 10,000m level.In honour of Halloween participate in the Skeleton Crew Challenge. It's a great way to earn all that Halloween candy! Working for that candy. 10k done only 21k to go. Must work harder!